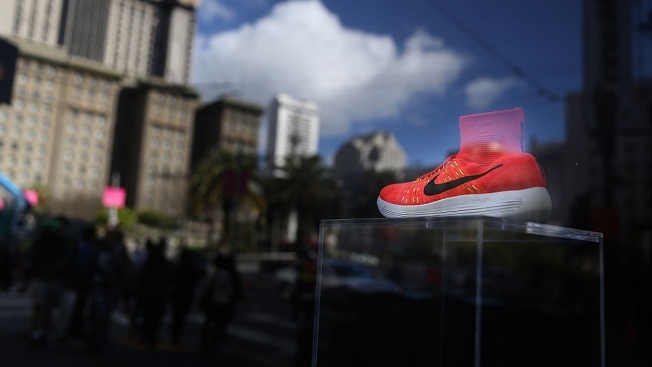 File Photo -- A Nike shoe is displayed in a window at a Nike store on March 22, 2016 in San Francisco, California. Nike has announced a new business structure which includes cutting 2 percent of its global workforce on Thursday, CNBC reported. Shares of Nike's stock were falling more than 2 percent Thursday morning following this announcement. The new structure will focus on serving consumers in 12 cities across 10 countries and simplifying its business in North America, Europe, Middle East and Africa; Greater China; and Asia Pacific and Latin America. Additional plans include a faster pipeline to serve shoppers with customization options. "Nike's leadership and organizational changes will streamline and speed up strategic execution," Nike said in a statement Thursday.